ST. GEORGE – “Generally, a 40th birthday can be a rather dubious milestone. But in the airline industry, it speaks of survival — and in SkyWest Airlines’ case, the ability to thrive despite the odds,” said Marissa Snow, Manager Corporate Communications for SkyWest. High speed go-carts, businesses from around the world, and charity all come together to be part of SkyWest Airlines’ Mini Indy! In the event’s 12-year history, Mini Indy has raised more than $800,000 for United Way Dixie, benefiting nonprofit organizations throughout Washington County. SkyWest and the City of St. George will host more than thirty businesses and teams from around the world as they compete in the Mini Indy and participate in surrounding events this March. From the private golf tournament at Sunbrook Golf Course to the race dinner and auction benefiting United Way, this year’s Mini Indy promises thrills from start to finish. 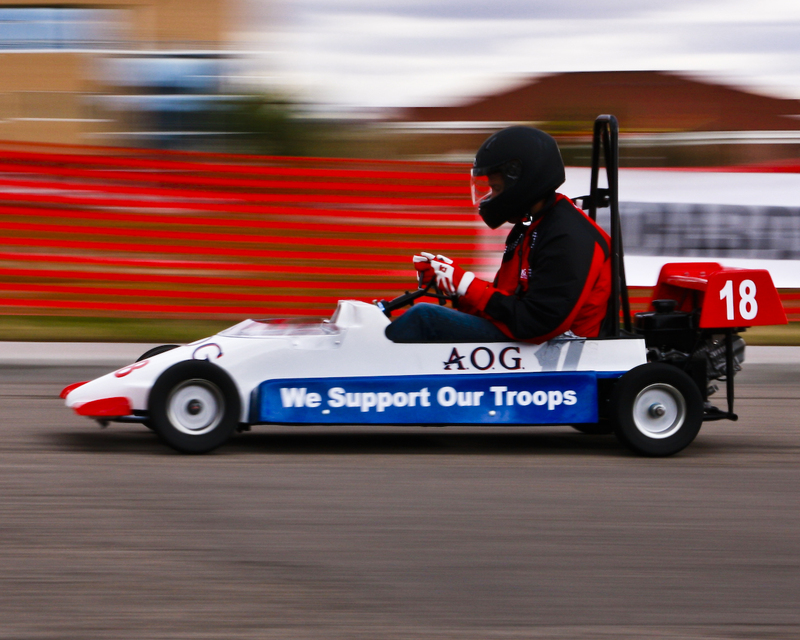 The checkered flag will fly on March 23 at the former St. George Municipal airport – known to Mini Indy participants as “The Black Hill Speedway.” There, more than 30 teams will push their go-carts to the limit in pursuit of Mini Indy fame. 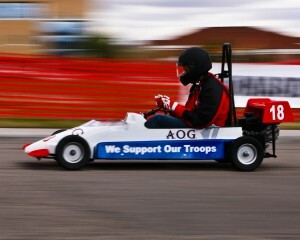 The event’s adrenaline and fierce competition will take place in a series of heats throughout the day. SkyWest began operations in 1972 and now employs over 11,000 people nationwide (500 of those being in St George). The company carried over 24 million passengers in 2011 and, although the airline industry has suffered losses, contraction and financial woes since September 2001, Snow said that SkyWest has weathered the storm and is in a strong financial position. So the 40-year mark is a big deal for the local company and the milestone will be recognized with events that will bring attention to SkyWest and St. George. 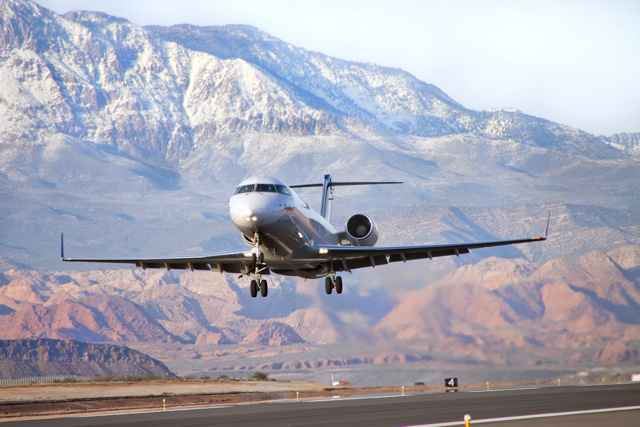 The airline industry as a whole is facing challenges with an aging pilot pool and the mandatory retirement age of 65-years, but SkyWest has anticipated this issue and Snow says it will not impact the airline because of advanced planning and foresight. Through growth, expansion and mergers, SkyWest has grown into the largest independently owned regional carrier in the U.S. with 318 aircraft and $13.8 billion in revenue. SkyWest’s own efforts at diversification took the form of acquisitions of Atlantic Southeast Airlines five years ago and a small stake in Brazil’s Trip Airlines in 2008. But SkyWest appears less inclined than Republic to embrace the idea of so-called brand flying. “Our focus is going to stay in the niche of being a regional carrier and trying to find other ways to diversify and continue to build our portfolio with new partners in the future,” said Russell Childs, President and COO of Sky West, according to AINOnline, an Aviation International News website. “SkyWest, Inc., headquartered in St. George, Utah, is the holding company for SkyWest Airlines. 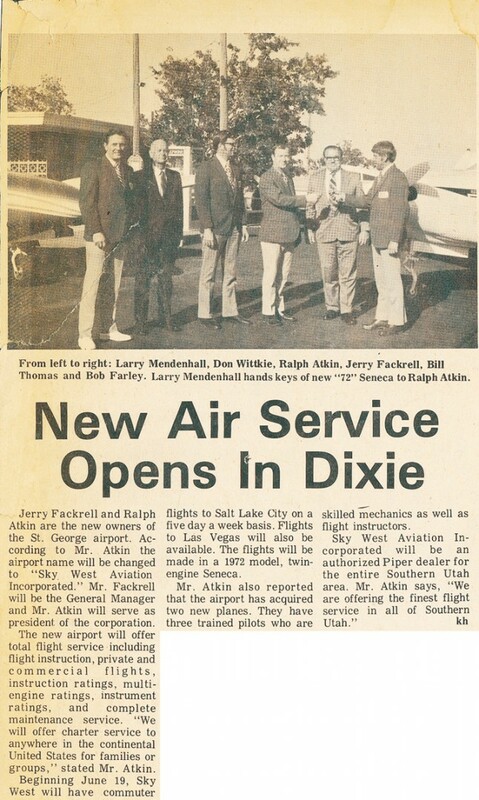 SkyWest Airlines was founded in 1972 by Ralph Atkin to meet the needs of businessmen traveling between Salt Lake City and St. George, Utah,” according to its website. “During the first year of operations, 256 passengers utilized the services of the fledgling airline. “In 1985, SkyWest Airlines signed a marketing agreement with Western Airlines to fly for them as Western Express out of their hub in Salt Lake City. In 1987, Delta Air Lines acquired Western. SkyWest then began a partnership with Delta as one of their Connection carriers and today continues that partnership with more than 435 daily flights, operating primarily out of Delta’s hub in Salt Lake City. Rex Jensen is a published writer and former newspaper editor. Rex has been a business owner, an educator, a military helicopter pilot and has a degree in political science. Great article by a talented writer! 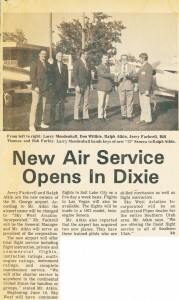 So happy for St. George to have a prosperous business such as Sky West. It’s the little airline that could.